Download "The Wolf" completely free! Born in 1986 in the south side of Chicago, Shawn James had a hardworking, kind mother and a gambling, abusive, drunk father. He grew up singing in church and was drawn to the emotional and ethereal power that music could have over people. It was there that he found his escape and learned how to harness his unique, soulful voice. 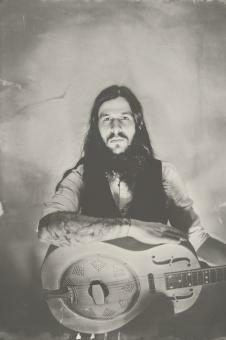 Shawn now lives in Fayetteville, Arkansas playing a raw, haunting mix of Blues, Folk, and Soul music. You might catch him playing on the street in the rain some night, rockin at a bar while you get rowdy, or you might just find him performing an intimate set for friends at a house show. No matter where you see him, just make sure you have your eyes and ears open, his performance will be one you won't forget.